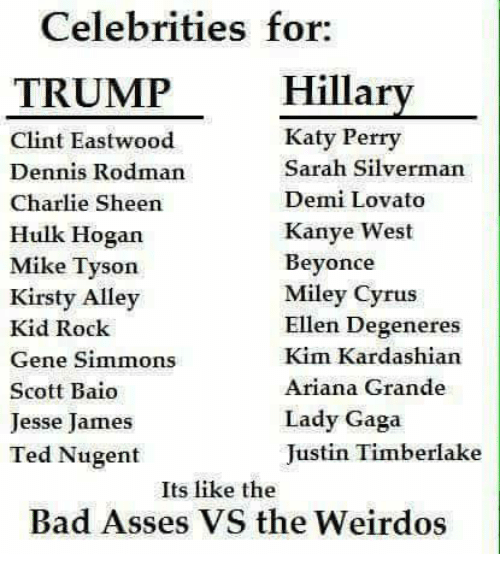 Memes, News, and Fox News: "Don't push your vieWS on me and I won't push my views on you. Don't try to erase the wonder that this country is." 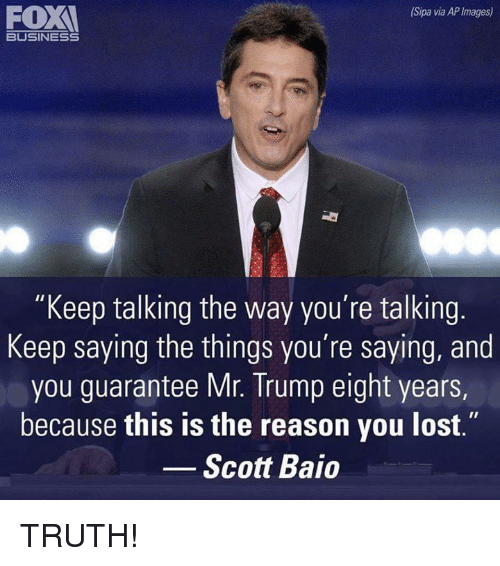 -Scott Baio FOX NEWS On "Watters' World," Scott Baio made it clear he's had enough of the political correctness that in some cases leads to violence. 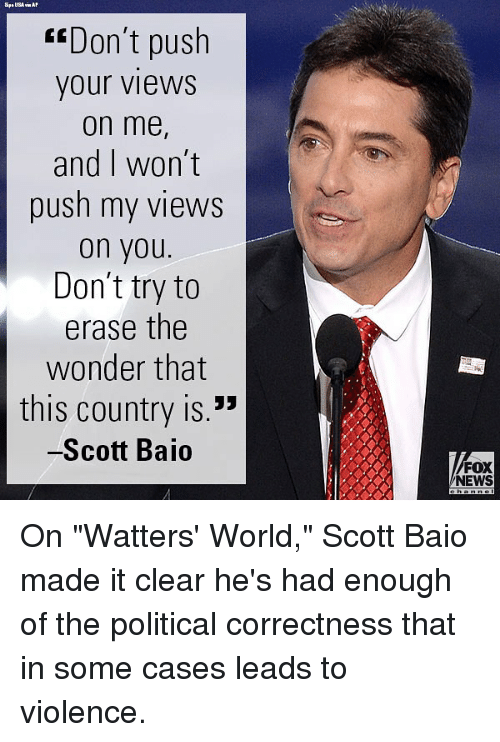 On "Watters' World," Scott Baio made it clear he's had enough of the political correctness that in some cases leads to violence. Memes, News, and Fox News: AP Photo/J. 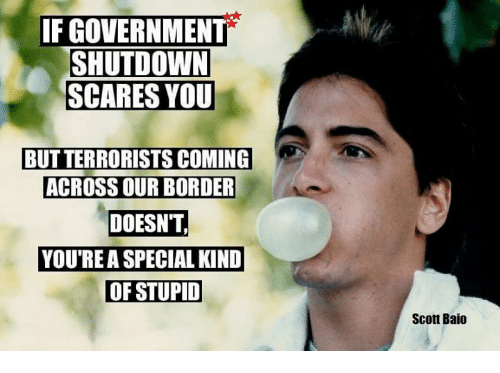 Scott Applewhite FOX NEWS channe "We know who Trump is, and we don't believe the propaganda, and I don't think most of the country does, either." 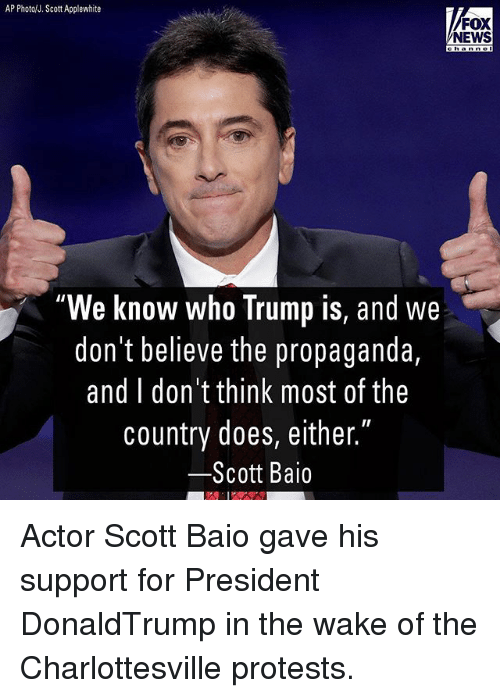 Scott Baio Actor Scott Baio gave his support for President DonaldTrump in the wake of the Charlottesville protests. 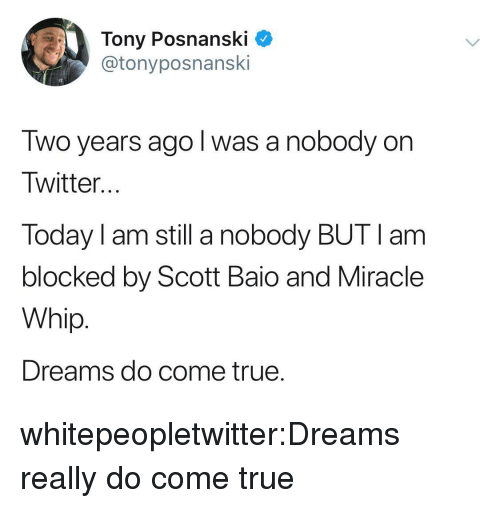 Actor Scott Baio gave his support for President DonaldTrump in the wake of the Charlottesville protests. 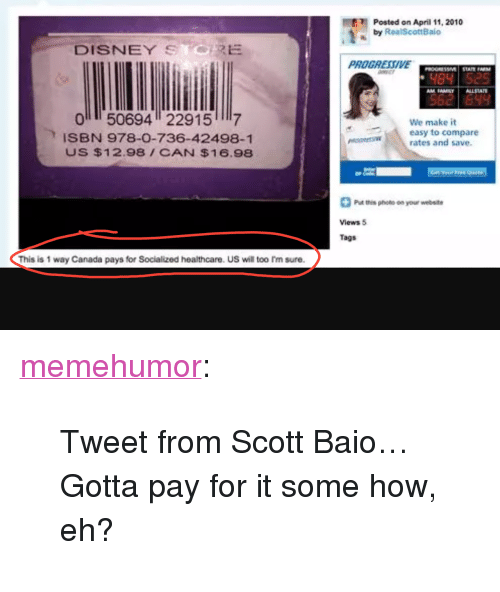 memehumor: Tweet from Scott Baio… Gotta pay for it some how, eh? 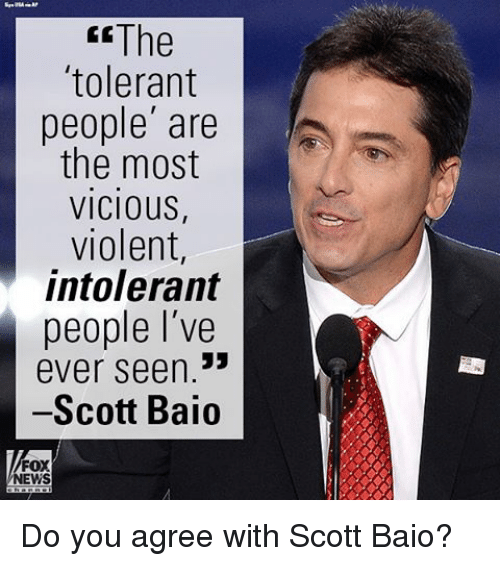 Memes, Vicious, and 🤖: The tolerant people are the most VICIOUS violent intolerant people I've ever seen Scott Baio FOX NEWS Do you agree with Scott Baio? 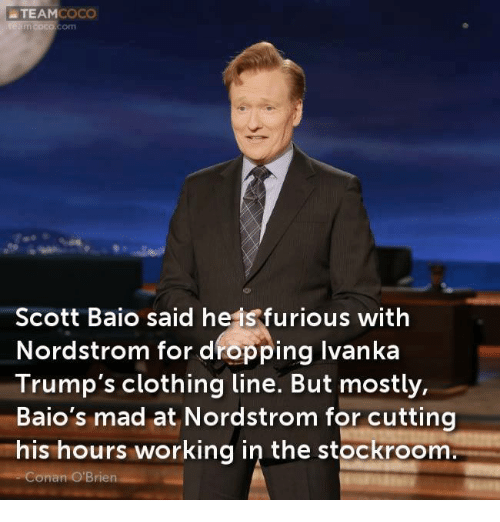 Do you agree with Scott Baio? Memes, 🤖, and The Thing: FO (Sipa via AP Images) BUSINESS "Keep talking the way you're talking. Keep saying the things you're saying, and you guarantee Mr. Trump eight years, because this is the reason you lost." 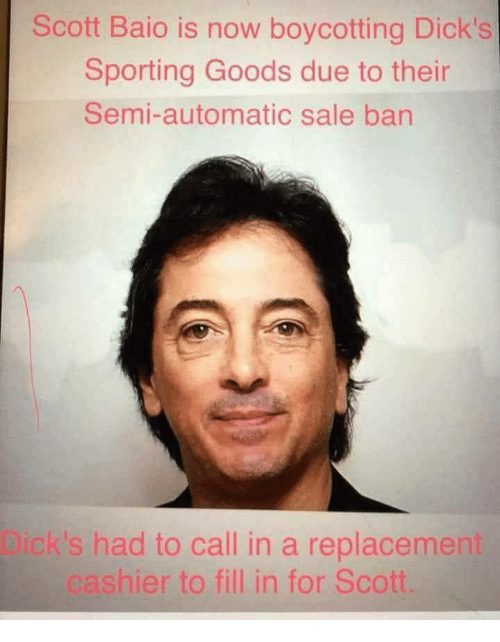 Scott Baio TRUTH! Memes, Fox News, and Justice: EE should not be put into a position where I'm afraid for my life and the life of my nine-year-old daughter because of my political beliefs." 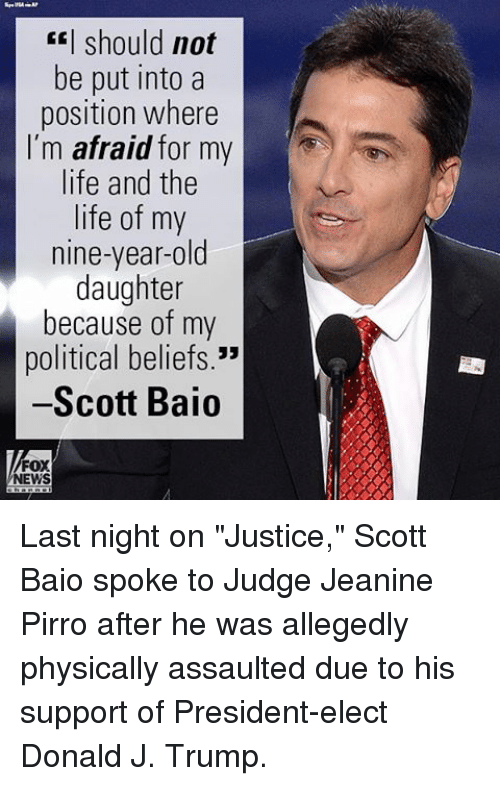 -Scott Baio FOX NEWS Last night on "Justice," Scott Baio​ spoke to Judge Jeanine Pirro after he was allegedly physically assaulted due to his support of President-elect Donald J. Trump.